It's Wednesday again: the day Julia hosts a worldwide deskhop. If you don't know what's happening, check out the Stamping Ground blog. You'll find links to desks all around the world. Join in the fun! My desk today shows work in progress. I wanted to make a blue spread in my art journal (the spread had some blue ink on it as a starter) and the other night I decided it would be built of fingertip sized pieces of underpaper. So I've been doing a tear-and-glue-it-down kind of thing for a couple of days. No real plan, but it's looking fine so far. The brown cards with rusty circles are for the PA abstract art challenge. Probably this blue spread too. 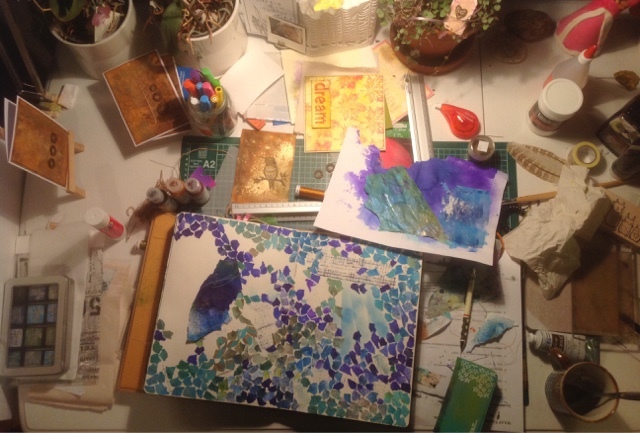 The hummingbird is on it's way, but practically everything else is stuff that should be put away... perhaps once this blue thing is done :) Oh, and the face I found on the desk last week is already in the book, see the spread here. Berautiful! It looks a bit like mosaic. Oh, this mosaic method is so awesome! I'm sure it's going to come together beautifully - partly because those are some of my favorite colors you're using and party because it already looks so great. Craft on! I love that mosaic technique you are doing.